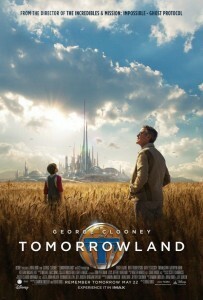 In a recent movie, Tomorrowland, a young woman touches a magical medallion, and is transported to another world, where it is safe, beautiful, and enlightened. When she lets go of the button, she’s back in her ordinary world. When I first saw this, I thought immediately of how it was just like the working of mantra in Buddhism, under the right circumstances, it can shift a person’s awareness immediately, and produce the vision of a Pure Land that has been right here all along. The Chan Master Hsuan Hua said, ‘The ten dharma-realms are not outside of a single thought’. The ten dharma realms is a poetic way of saying all worlds. His teaching, and that of the early Zen traditions, explicitly, is that everything we experience comes from our mind. Not everyone can see the other world in Tomorrowland, the woman’s father, for example, and so, in tantric terms, that experience has to be for the right person, doing the right practice, at the right time. 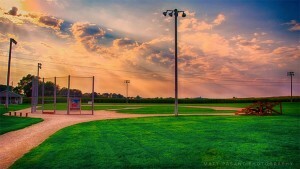 Another film that has interdimensionality as its main theme was Field of Dreams. This picture also explored the idea of another realm right here that is invisible to some, and that could be accessed and enjoyed. A Sci-fi/horror film that also makes use of this device is The Others. A few more are The Lake House, Ghost, and Frequency. As with time travel movies, these films usually center around the effort of the protagonists to move between the worlds. When we speak or write or make movies about inner realities, it’s very easy to impose the laws of the physical universe. We talk for example of deeper levels of consciousness as if there were some distance to travel to reach the realization. 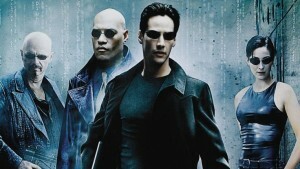 The Matrix Trilogy is perhaps the most well known series of films with interdimensionality as one of its main themes. There, you will recall, the characters have run to make it to particular portals to pass into other places. These remind me of philosophies, or of genres in film, such as horror or those dealing with the supernatural, that seem to be second or third or twelfth hand telling of a genuine experience. People sense some truth in the story, but they are pretty far off for anyone with an experience of what we call other realms. With ordinary thinking, we base our ideas about ourselves just on the evidence of our five senses. It is a deeply impoverished view. It’s much more true to see our living here as multi-dimensional, and our identity as an inter-identity with all others. Thich Nhat Hanh calls this inter-being. What to make of all this? It is just philosophy or Science Fiction? For more than 2,000 years, the Buddhist tradition has not only proposed an enlightened world view, but has offered ways to experience this for ourselves. The Avatamsaka Sutra, also called the Flower Ornament Sutra, is an evocative, poetic, inspiring text, presented entirely from the point of view of someone who is awake. Thich Nhat Hanh recommended that we not try to read this text like a novel, but rather that we immerse ourselves in its beauty and majestic vision. This is what we see when we go beyond ego-grasping, with love and wisdom: the world does not disappear, far from it. We enter a Pure Land, without confusion or affliction. 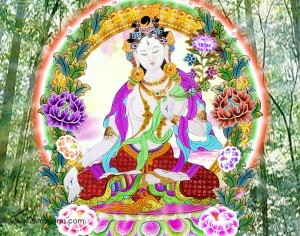 We experience what the Avatamsaka Sutra calls the Entry into the Realm of Reality. On one retreat I attended with him in the 1990’s, Thay said, in the Avatamsaka realm, the first thing that you notice is that there is a lot of light. The beings in that realm emit light, and if you are struck by one of the beams of light, you yourself begin to emit light as well. There is also a lot of space, plenty of space and time all around, as well as flowers, jewels, and lion seats, where we can sit with grace and dignity. Everything there is spoken of in terms of oceans, such as oceans of vows, oceans of peace, oceans of joy, oceans of faith and so on. This is something we can learn to experience here and now. This would be just a fantastic story, or possibility, if it were not for the compelling, suffering state of our world, with its potentially endless tragedy of delusion people experience. When we join the awareness of the pain of this world with a knowledge of its other possibilities, that are indestructibly here in everyone, a new dynamic, that of compassionate activity is set in motion. The truth is that it is possible for us all to access these dimensions with control, the worlds of light and peace, beauty, joy and great love. We can all draw from these as needed for inspiration and for healing. 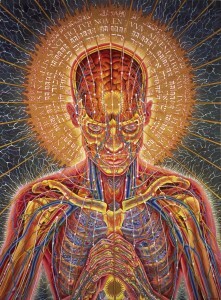 The visionary art of Alex Grey comes as close as I’ve seen to representing the way things are, when seen as translucent and numinous. Films such as Tomorrowland, Field of Dreams, and the Matrix offer us a clue that there are other dimensions, and something in us recognizes a truth in the telling. They can help us to begin to question our ordinary, partial perception, to begin to see, and to free our mind. By contrast, contemplatives, and the Buddhist traditions in particular, go much further. They assert that these dimensions are innately our birthright, each and every one of us without exception, and by teaching and example, they encourage us all to make this reality our own.